3700mAh battery capacity. Battery Capacity: 3700mAh. 1 x VPP-201-CO (Pebble). - Mini credit card sized portable design with included neoprene carry case. Perfect for handbag or pocket (3.5in x 2.5in x 0.5in). Pebble Verto, 3700mAh, 92.6g, White. Battery capacity 3700 mAh. you can buy in set of 6 max. Product colour White. we do not take any responsibilty after this. Audio Visual. Weight 92.6 g. Height 90 mm. Pebble Verto, 3700mAh, 92.6g, White. Colour of product: White. Product colour: White. Charging source: USB. Battery capacity: 3700 mAh. Images shown are for demonstration purposes. LED indicators: Y.
Pebble Verto, 3700mAh, 92.6g, Orange. Colour of product Orange. Battery capacity 3700 mAh. you can buy in set of 6 max. we do not take any responsibilty after this. Weight 92.6 g. Height 90 mm. Depth 14 mm. The PEBBLE Verto comes with 4 connecting tips to charge the most popular mobile devices as well as a carry pouch and charging cable. The powerful Veho PEBBLE Verto portable battery charger is the must have accessory to keep all your mobile devices full of charge. It packs a 3700mAh which is over 2 times the regular battery of the Apple iPhone or Smartphone which means it will keep your devices on the go and you won't have to worry about running low on juice. The PEBBLE Verto is perfect for festivals, camping trips, travelling abroad or as an emergency power pack for those busy days when your devices battery just can't keep up. The PEBBLE Verto will charge almost any portable device with connectors for the most popular Smartphones/USB charged devices/Veho MUVI and 360? range. VERTO PEBBLE POWER BANK. IT IS NEW ITEM FULLY TESTED WITH ORIGINAL OPEN BOX. Pebble Verto, 3700mAh, 92.6g, Orange. Colour of product: Orange. Product colour: Orange. During that process you will be issued with an RMA number. Images shown are for demonstration purposes. 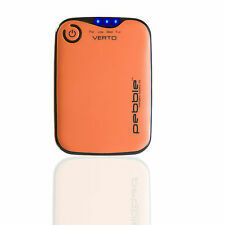 Veho Pebble Verto 3700mAh Orange power bank. Pebble Verto, 3700mAh, 92.6g, Orange. Colour of product Orange. Battery capacity 3700 mAh. It speeds things up if you can write your RMA number clearly on the outside of your parcel.